VERY FINE. 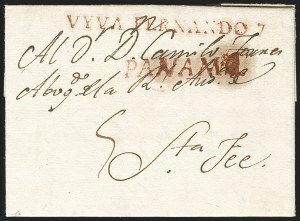 A SUPERB STRIKE OF THIS RARE CONDENSED "PANAMA" HANDSTAMP -- WHICH IS THE EARLIEST RECORDED USE OF A PRE-STAMP MARKING IN PANAMA. ONLY TWO EXAMPLES ARE KNOWN. AN ESSENTIAL ITEM FOR ANY AWARD-WINNING EXHIBIT COLLECTION. 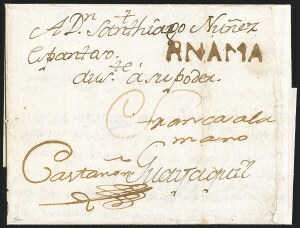 The other recorded example, ex Camino and Goeggel, has a similar quality strike but is undated. Ex Goeggel. With 2013 Moorhouse certificate. VERY FINE AND RARE. 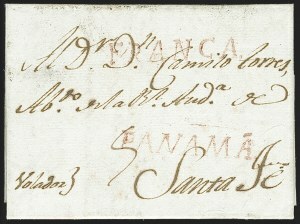 THIS IS THE ONLY RECORDED EXAMPLE OF THE "SANTA FE" HANDSTAMP USED IN PANAMA. VERY FINE. 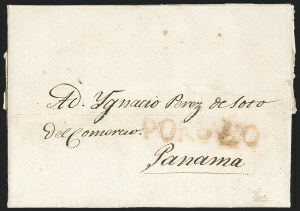 THE UNIQUE EXAMPLE OF THE PATRIOTIC "VYVA FERNANDO 7" HANDSTAMP ON COVER. The "VYVA FERNANDO" straightline refers to King Ferdinand VII of Spain who was then imprisoned in France by Napoleon Bonaparte. Ironically, the addressee Torres went on to become a leading politician and revolutionary figure in support of independence from Spain. He became President of the United Provinces of Nueva Granada in 1815 and was executed on Oct. 5, 1816 for treason against the Spanish monarchy. FINE. 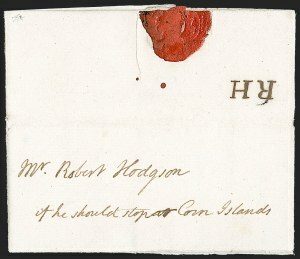 AN EXCEPTIONALLY RARE "PORTOVLO" HANDSTAMP. ONLY TWO ARE RECORDED USED DURING THE COLONIAL PERIOD AND THIS IS THE ONLY ONE FROM PORTOVELO. 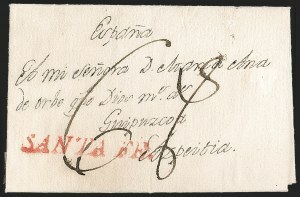 The other recorded Colonial use of this rare straightline is dated 1811 and was sent from London, England to Lima, Peru via Portovelo. VERY FINE. 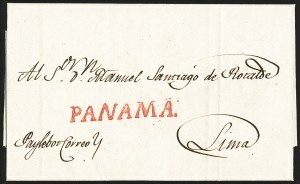 OF THE 21 "PANAMA" HANDSTAMPS KNOWN ON COVER DURING THE COLONIAL PERIOD, ONLY THREE WERE APPLIED IN TRANSIT. THIS IS THE ONLY EASTBOUND COVER KNOWN. 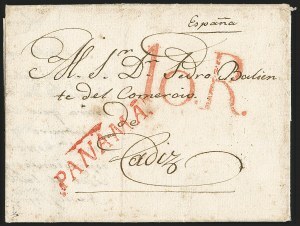 There are a total of four covers addressed to Spain -- the other three having originated in Panama. 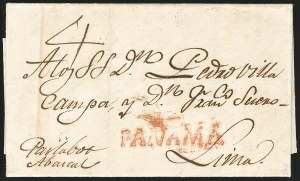 Interestingly, the 10 reales due marking would indicate this letter was treated as a second weight letter from Panama rather than from Peru.